Very good article in Bellingham Herald. Interview with my friend Zach. 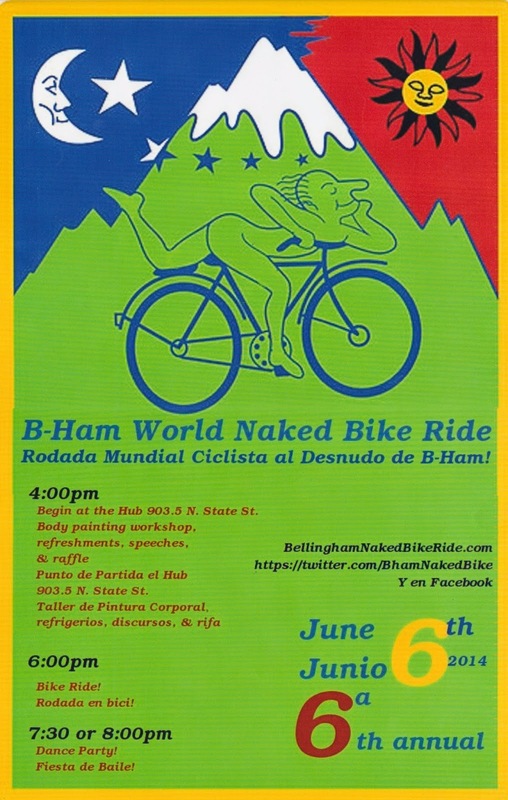 The sixth annual Naked Bike Ride on Friday, June 6, will, in fact, have people wearing clothes. "A lot of people plan to wear clothes," said Zach Robertson, one of the event organizers. "It's 'clothing optional,' so no one has to go naked. It's more of a space for people who want to be naked to be naked." Body painting starts at 4 p.m. and there will be a legal debrief and a raffle before the bike ride at 6 p.m. The route is set to start at the Hub Community Bike Shop on North State Street and loop around downtown on streets including Holly Street, F Street, Dupont Street and Railroad Avenue. Click here for a map of the exact route. Everyone is welcome to participate in the bike ride regardless of how they feel about their body, Robertson said. "I hear a lot of people say, 'No, my body's not good enough for this,' and it makes me sad," he said. "It's through the naked bike ride that you realize the human body is not very exotic and it's also not taboo. It's mundane." The naked ride starts a lot of important conversations, Robertson said. For example, there's not much difference between a bicyclist wearing clothes and a bicyclist not wearing clothes, but the ride draws attention to driving safety around bicyclists. It's also an opportunity to talk about issues with fossil fuels and body image. Those, organizers say, are the reasons behind the ride, which is part of a worldwide movement. Robertson said he hasn't heard anyone accuse them of looking for an excuse to go naked in public, but social change often brings criticism. "We're looking to be as gentle and communicative with people as possible. When you're doing something different, there's often a critique," he said. "But it raises a conversation that needs to be had." About 120 people participated in the bike ride last year, Robertson said. This year Chelle Beautiful will be available to body paint anyone who calls in advance at 360-599-5036. See more details on web site. shameful, have you no pride and i don't want to see you naked body i don't care how 'buff' it is. have some respect for yourself and other people. social change is nothing more than an excuse to be vulgar--criticism?? no modesty, decency--ever heard those words??? Avert your eyes for a few moments! The ride is about respect, pride, and acceptance.